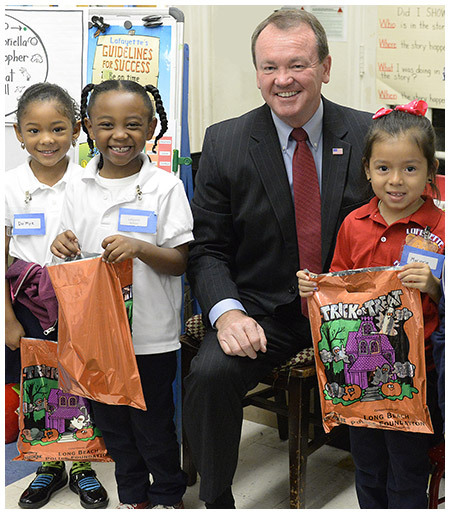 Long Beach Police Chief Jim McDonnell shared reflective trick-or-treat bags and Halloween safety tips with Lafayette Elementary School kindergartners this week. The treat bags came with glow sticks and a few treats, courtesy of the Long Beach Police Department. Among the tips: watch carefully for vehicles before crossing the street, avoid poorly lighted areas such as alleyways and homes where the porch light is off, remain in communication with a trusted adult, and avoid running in darker areas to prevent injury. SAFETY FIRST – Long Beach Police Chief Jim McDonnell with students at Lafayette Elementary School.